Yesterday’s signals were not triggered as the bullish price action took place slightly below 0.9958. Go short following a bearish price action reversal upon the next touch of 1.0069. Go long following a bullish price action reversal upon the next touch of 0.9958. I wrote yesterday that the best potential was likely to be on the short side now. I was ready to be bearish at a reversal at the trend line or at 1.0069. We never got this, but I was right to think the short trade probably wouldn’t set up. Instead we got a strong bounce at the support level, but as the low was a little below the level it wasn’t technically a long trade entry. In any case, the support was confirmed as good, so I think overall, we have strong technical levels here to look at, both long and short. I have no short-term directional bias, but I still think the greater opportunity for a long-term price movement is downwards as we are selling off from an area above parity (1.000). 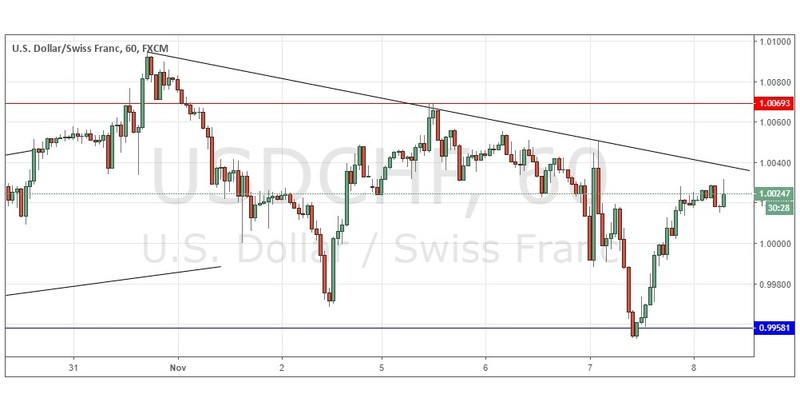 There is nothing important due today concerning the CHF. Regarding the USD, there will be a release of the FOMC Statement and Federal Funds Rate at 7pm London time.